The cruise left from Portland which was a couple-hour drive south of our campsite, so it was another early morning. Not as early as sunrise on Cadillac Mountain, but 5:30 a.m. is still a pretty serious wake up call, even on your birthday. We wearily rose and made some coffee and we were in the car by six. The morning air was extremely nippy, and the air on the open ocean was sure to be even colder, so we were quite bundled. We arrived in Portland around 8 a.m., checked in with the cruise desk, and as is customary after our longer drives, immediately needed to find a bathroom. We shivered as we walked the pristine, historic streets of Portland until we found a local coffee shop for our second coffee of the morning. It was starting to warm, but we knew the cold was just waiting offshore. We made it back to the pier, and after only a few moments we were on board. We immediately sprinted up the stairs to the top of the boat, where of course you can find the best views. But as we would soon find, it’s also where you will find the shivering people cowering together for want of heat. We slowly rode out of the port eagerly snapping photographs of the bay’s three lighthouses and many birds. The boat continued out to sea toward an underwater cliff shelf where whales feed. The captain, who was an amazing tour guide, told all the passengers to keep an eye out for whales and if we see any to let him know. Wait, we paid $48 per ticket, and they don’t have some kind of fancy schmancy whale capturing sonar? I’ve never seen a whale in the water, we have no idea what to look for, especially in these choppy waves, and I’m starting to get cold? I wondered aloud, how much would these tickets cost if we hadn’t done work-study? Well, I’ve always wanted to work on a boat. About an hour and a half into our ride, another passenger spotted what she thought was a fin. 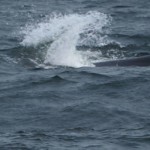 The captain said it may be a finback whale, which is the world’s second largest whale. For the next forty-five minutes we would chase him through choppy seas. Every five to ten minutes, the whale would surface and we’d chase him to until he dove again. It’s probably the best we could hope for since finbacks are some of the fastest whales in the ocean so we were lucky we were able to stay with him so long. It was actually quite an interesting cat and mouse game. He was definitely playing with us! 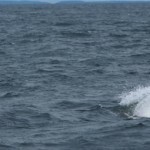 While the result was a little disappointing, WE WERE WHALE WATCHING IN MAINE, on my birthday! There is literally not a better way I could have imagined spending my 36th! To schedule a tour for yourself, click here.